A US student freed from a North Korean jail has been in a coma for more than a year, his parents have said. 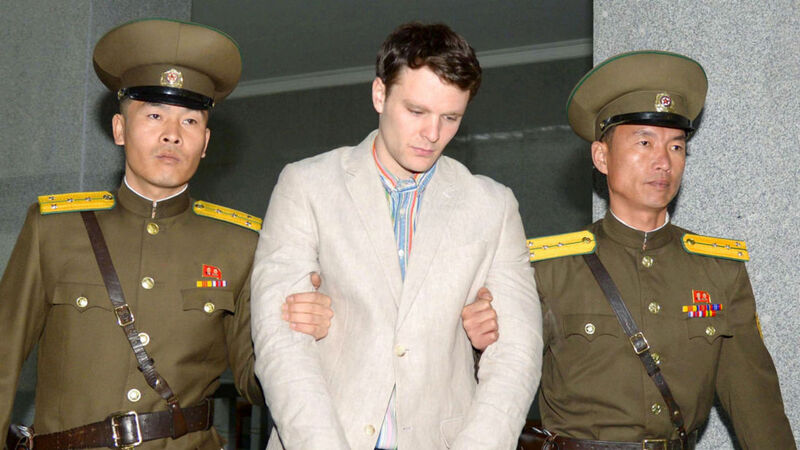 Otto Warmbier, 22, was sentenced to 15 years in prison with hard labour in March 2016 after admitting he tried to steal a propaganda sign from a hotel he was staying at. Mr Warmbier was released on Tuesday but had to be medically evacuated from the country after it emerged he had been in a coma since he was jailed. North Korean officials told Mr Warmbier's family he fell ill from botulism after his trial then went into a coma after taking a sleeping pill. The student's parents, Fred and Cindy Warmbier, said they were only informed of his condition last week. In a statement, they said: "We want the world to know how we and our son have been brutalised and terrorised by the pariah regime." Swedish diplomats, who represent the US in North Korea, were denied access to visit Mr Warmbier, the Washington Post reported. US Secretary of State Rex Tillerson said the release was secured "at the direction of the President", adding that Mr Warmbier was "en route to the US where he will be reunited with his family". Mr Tillerson said he would not comment on Mr Warmbier's condition, but added that US officials are continuing "to have discussions" with North Korea about the release of three other jailed American citizens. Before his trial, Mr Warmbier said he tried to steal the propaganda sign as a trophy for an acquaintance who wanted to hang it in her church. He told reporters he was offered a used car worth $10,000 (£7,840) if he could obtain a sign, adding that $200,000 (£156,860) would be paid to his mother if he was detained and didn't return. Mr Warmbier said he accepted the offer as his family was "suffering from very severe financial difficulties".